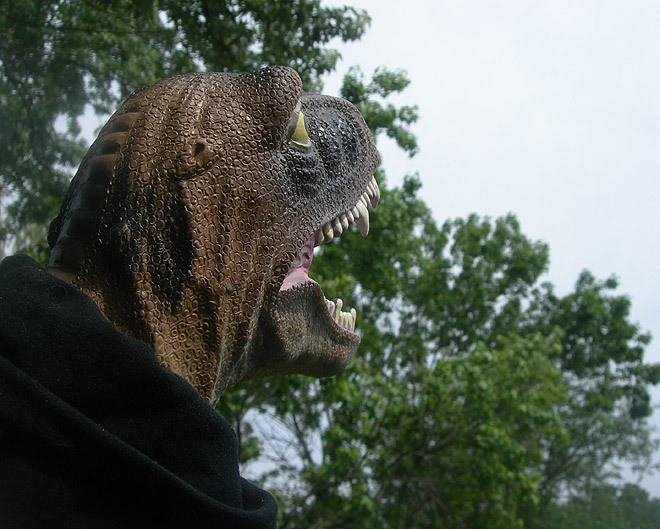 Dinosaur Dracula has hatched. Pull up a chair and have a slice, bro. This is going to be a long, rambling intro. I’ve already ditched around twenty attempts at writing it. 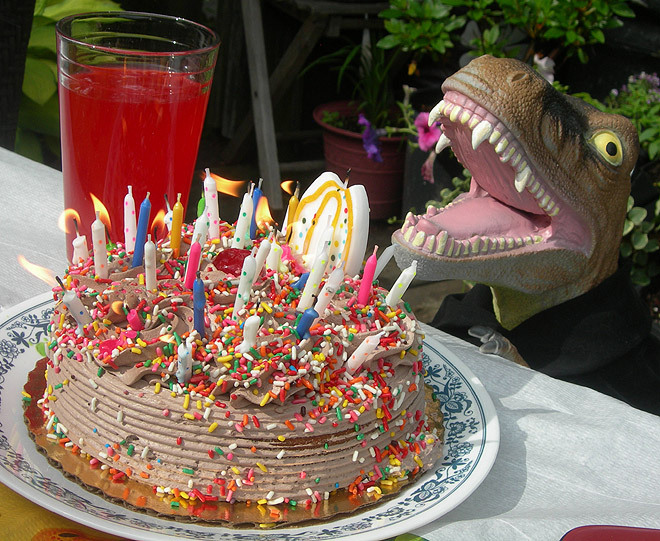 I ran X-Entertainment from April of 2000 through today, and it was a great ride. That site changed my life in many unbelievable ways. But over the last two years especially, for reasons both legitimate and only in my head, it became an albatross. A weirdly stifling, big, squawking albatross. It’s important to know when your surroundings aren’t bringing out the best in you. This is true in every facet of life. Often, there isn’t much you can do about it. With this, I can. The things that were stopping me were so bogus and pointless. If my Internet desires run no further than running a goofy site that people have fun with, I could be doing that so much more effectively. Hopefully, now I will! 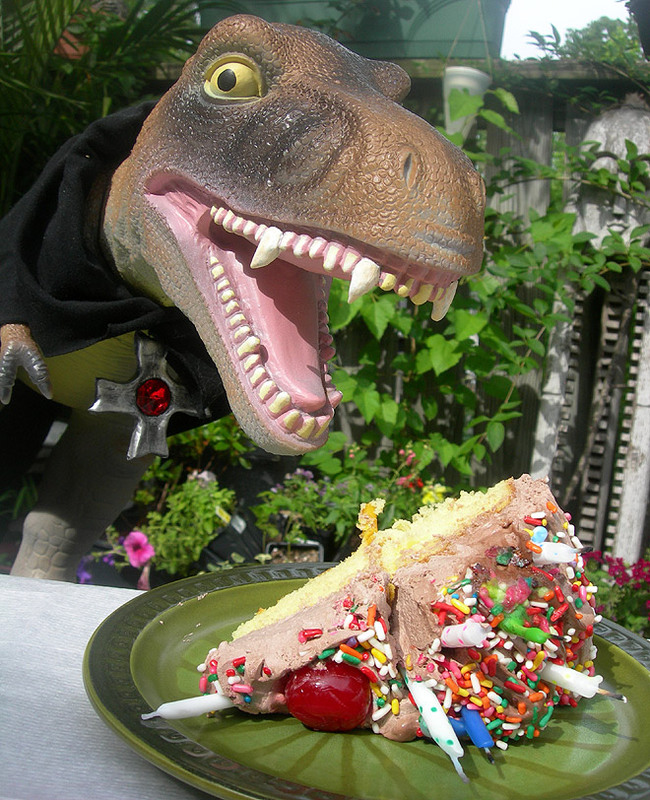 Because I don’t know how a site that launches with photos of a rubber dinosaur eating cake could ever be not-fun. 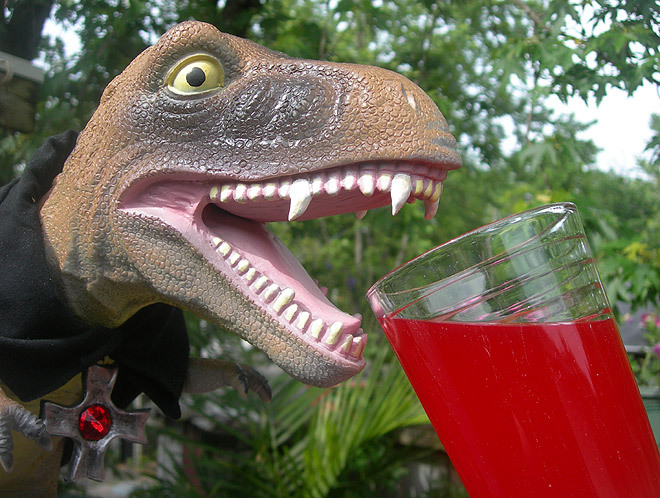 So, what’s different about Dinosaur Dracula? Many people think X-E kinda died when it switched to the all-blog format. I don’t. In some respects, those were my happiest years on the site. They were certainly the most freeing. Even so, I intensely disliked the idea that everything I ever did would just fall into the abyss as “another blog entry,” and I wanted the opportunity to “go long” and make a bigger deal out of trivial things without feeling like I’m adding carrots to a soup that already has 500 ingredients. Solution? The Features Page, which is essentially my return to “real articles.” The hope is to add a new feature at least once a week. The stuff that goes there is whatever feels deserving of a truly standalone tribute. I’m starting the site off with three of ‘em. Something about a bee, something about old trading cards, and something about a hidden object game based on a real life murderer. I’d like to imagine that these three share a theme. But I did love the freedom that the X-E blog brought me, where I could write about the differences between fire brick and electric crimson whenever I damn well pleased. So, at Dino Drac’s heart is this, its blog, which will be updated more consistently. Even if the site seems a bit simplistic right now, there’s a lot of power behind it. The structure, coding and general design motif was developed by Cliff of Cliffpro, who did a tremendous job in creating something that can carry me through the next several years. Cliff was a pleasure to work with. Patient, proactive and willing to figure out anything, no matter how weird. With Dino Drac, the building blocks are in place for a bright future. Thanks for all of your hard work, Cliff! I also have to thank Jason Week of DuncePress, not just for that kickass logo that tops every page of this site and makes its ridiculous name make sense, but for assorted other graphics, and perhaps most importantly, for being a sort of artistic advisor who helped see this thing through when I was too frustrated to move forward. Jason gave up plenty of his own time with no reward, and I could never thank him enough for that. He is one talented mofo with a great attitude who is destined for the kind of fame I will someday envy. Making a custom site like this is never easy, and without those two guys in the missile launchers, God knows how long this would’ve taken. It’s worth mentioning that I’m considering this “Version 1″ of the site. There are still some tweaks to make, and now that the site’s live, things that weren’t apparent to me before will become clear. If anything seems wonky or misshapen, don’t worry, it’ll get ironed out. As for the future? Big things in store. This is a blank canvas. Wait until you see it painted. I drool at the thought. 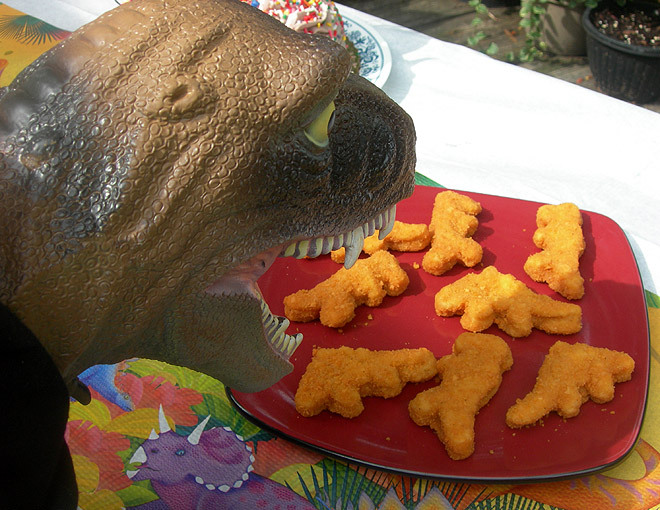 Oh God, Dino Drac is eating dinosaur-shaped chicken nuggets. Yessss. Thanks to everyone who read X-E and made me feel like there was enough support left for this to be worth the effort. The site is a hobby so I’m going to avoid promising anything (work always comes first), but trust me, I wouldn’t have gone through the trouble if I didn’t want to do a lot better, and a lot more. Reach for the stars, Dino Drac. You have no meaning and you live by no rules. You can be anything. I don’t know, it seemed like a good idea at the time. Okay guys, go skim through the new stuff, and once the smoke settles, we are OFF.